Put the beer and sausages into a pan and cook on medium for about 25 minutes, flipping occasionally until the sausages are cooked and the beer has reduced to a glaze. Remove from heat. Remove the sausages from the pan and cut into rounds. Add them back to the sauce and stir to combine. To make the pizzelles, simply combine all of the ingredients and stir well. Cook about 45 seconds in your pizzelle maker and fold into a cone shape. You need to work really quickly because after only 15 seconds they can become too brittle to fold properly. Allow them to cool and they will harden in the shape. Mix the potatoes according to the instructions on the packaging. Finally, fill some potatoes into each cone, top with one of the sausage rounds and serve! You are out tailgating before the big game in the crisp fall weather enjoying an Octoberfest beer or even a hot toddy. Someone hands you a plate of food. Now you suddenly have to manage a plate, beer, AND fork?!? And you can forget about playing beer pong, using your phone, or any other activity that you need your hands for. Thats where these Sausage and Potato Cones swoop into play. You can one-hand this thing and still enjoy your beverage, play your games, and communicate like a modern adult. First you need to make the pizzelles. You can do this part way ahead of time and just bring them to the party. Mix all the ingredients and let the pizzelle cooker do the hard work. This recipe has about half as much sugar than normal so it doesn’t feel like a dessert. Place on a plate with the seam down so they can cool and harden into the right shape. Meanwhile, mix up the potatoes. 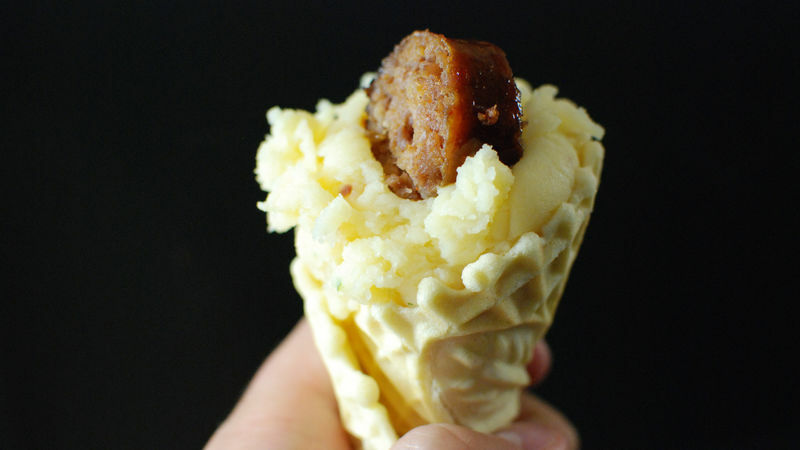 Scoop the potatoes into the cone and pop a sausage right on top. Then hand it to the nearest fan and you've got a party! Dan Whalen needs more arms. Or a beer helmet. He has been blogging for over 5 years at The Food in my Beard; check Dan's Tablespoon profile often to try his recipes with creative international spins!